Some of the biggest changes in iOS 10 are on the screen you see first when you pick up your device - the iPhone lockscreen. If you're a seasoned Apple user who's got comfortable with the way the mobile OS works then the updates can take some getting used to. From the way you interact with notifications (which have also been updated) to the gestures you use to actually get into your phone, there's a lot that's different - here's our complete guide to everything you need to know to make sense of the iOS 10 lockscreen. There are some variations based on whether you're using a 3D Touch device or not - basically anything from the iPhone 6S onwards, except for the iPhone SE - but in most cases there are replacement options or gestures to help you accomplish the same tasks. 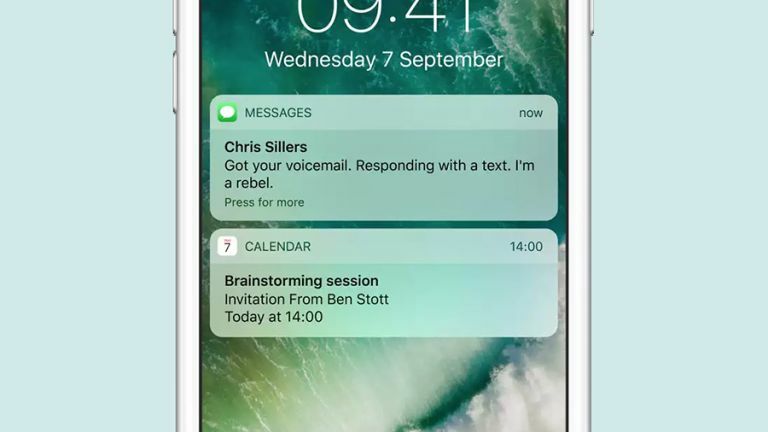 Raise to Wake is a new feature that automatically displays your notifications and other lock screen information as soon as you pick up your phone - it'll work as long as you're using an iPhone SE, iPhone 6S, iPhone 6S Plus, iPhone 7 or iPhone 7 Plus. If you don't like this automatic behaviour, you can switch it off: go to Settings and Display & Brightness, then toggle the Raise to Wake switch to off. It's designed for the benefit of users who would otherwise go straight past the iOS lockscreen with a Touch ID-enabled press of the home button. Remember you can also bring the lock screen up with a press on the Sleep/Wake button. The new, richer interactions in iOS 10 let you jump straight to apps or carry out tasks inside apps without having to launch the app itself (like cancelling an Uber ride). Use a 3D Touch (hard) press on a notification on the iPhone lockscreen to see what options are available (unsurprisingly, Apple's apps were among the first to get interactive support). If you're on an older device that doesn't support 3D Touch, press on a notification and swipe to the left to see various options pop up. If you choose to follow up with one of the interactions and head into the app, you'll need to unlock your phone. Swipe down from the top of the lock screen and you can clear previous notifications one by one (or all at once with a 3D Touch on the top X). Again, you can clear or interact with each alert with a 3D Touch (newer devices) or a swipe (older devices), using the same gestures as on the main lock screen. As iOS 10 becomes more established, you should see more and more apps taking advantage of these iOS 10 lockscreen interactions. The old familiar "slide to unlock" button has been ditched on the iOS 10 lockscreen in favour of "Press Home to unlock", which will no doubt cause you plenty of confusion to begin with. If you'd rather just rest your finger or thumb on your (Touch ID-enabled) iPhone or iPad rather than have to physically push it then head to the Settings app, tap General, then Accessibility, then Home Button - turn the Rest Finger to Open toggle switch to on. Swipe left to get to the camera (don't worry, no one can take a shortcut to your photos if your phone's locked), or right to get to the iOS 10 widgets. Scroll all the way down to the bottom of this widgets screen and tap Edit to change what shows up here. You can also search your iDevice and the web at large through the box at the very top of the page. As in previous versions of iOS, you can configure various aspects of the iPhone lockscreen interface and change the different options available to you. From Settings, tap Touch ID & Passcode, then scroll down to the Allow access when locked section. The Today view, notifications, Siri, instant reply, smart home control and access to Apple's Wallet app can all be switched on or off. Armed with that knowledge, you should be able to find your way around the iOS 10 lockscreen and all its various features - at least until Apple decides to change everything around again in the next iOS update.